I think you’re silly if you aren’t partial to a little pampering every now and again. Lord knows we all need it after a busy festive season! 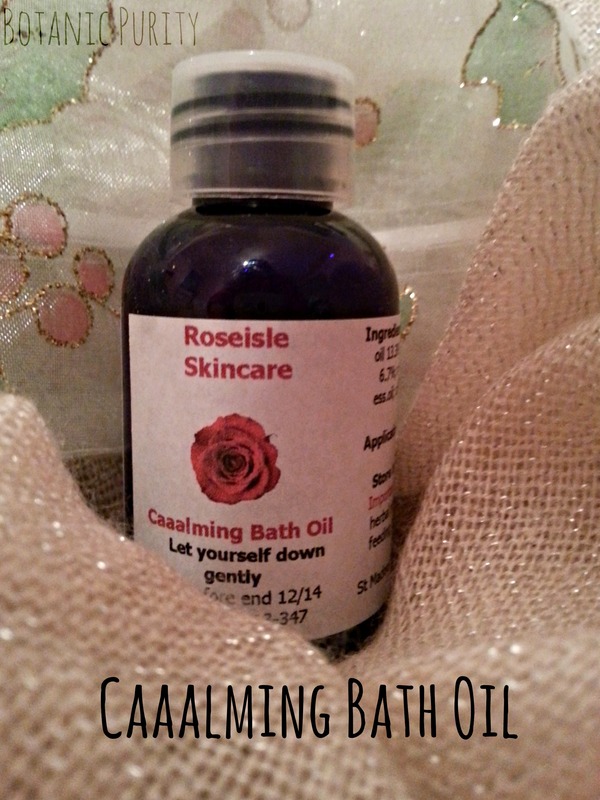 For my own little routine I have been on the hunt for an affordable yet organic/natural bath oil for a while, so I was delighted when new natural skincare company RoseIsle followed me on Twitter and said hello! I love investigating new, small companies so after flicking through their website and discovering the Caaalming Bath Oil* (£20.75 150ml) I was intrigued to say the least, and delighted when they offered me a little sample to try at home! Created by Reflexologist Paul Hammond, RoseIsle was born when Paul moved to Scotland and started to study and create natural products that would be beneficial to the whole body. He explains “We are but simple country folk and we think it makes sense to steer clear of unknown” – a wonderful philosophy I say! RoseIsle manufacture only natural and organic skincare goodies, including a full facial, hair and body care ranges, plus a few little extras such as baby care and lip care. They’re a really great small, ethical company – definitely worth checking out! I was so excited when I received my bath oil, and put it to the test almost straight away! I’m usually a morning shower person, but treated myself to a little weekend pamper at my Fiancé’s house (he has an amazing roll-top bath… don’t mind if I do!) The things I would look for in a bath oil would be quite a strong fragrance for the duration of my bath, good texture to the oil and a sense of luxury, and I’ve gotta say that this bath oil ticked all the right boxes. Admittedly I did leave the bath a little oily still, but I think that’s simply because I added too much. The suggestion was to add about 2 tablespoons, but as my skin struggles to absorb much I think I could get away with a little less! The scent of the oil is incredible, and features some of my favourite fragrances: bergamot and mandarin, which are carried by rosehip and castor oils. Rosehip Oil is extremely beneficial to our skin; not only does it have wonderful anti-ageing properties, but it also helps to heal and regenerate our skin, reducing the appearance of our scars and making our complexion glow. Prickly Pear Seed oil also makes an appearance, which isn’t an ingredient I know much about. It is said to prevent dehydration, keeping our skin plump and smooth, whilst also helping to minimise the appearance of pores… yes please! My only word of advice? Use this at night! I’m not sure if you’ve ever tried putting on jeans whilst covered in oil… but it’s an unpleasant experience. This oil would be absolutely perfect to use on an evening after a stressful day with candles lit and a good book, allowing your skin to drink up all the oil overnight. I would definitely 100% recommend this bath oil to anyone, and will definitely be repurchasing in the future. Their ‘Bathing Plus’ range also features Shower Clay, Bathing Salts and Bath Bombs, which all sound really intriguing and lovely – this is definitely a great, affordable brand with plenty to offer, so please do give them a try! Vitis vinifera (grapeseed) oil*, ricinus communis (castor) oil*, leurites moluccana (kukui) nut oil*, opuntia ficus indica (prickly pear) seed oil, rosa canina (rosehip) seed oil*, citrus bergamia (bergamot) ess.oil*, citrus sinensis (mandarin) ess.oil*, origanum maiorana (marjoram) ess.oil*. This sounds really lovely. I do love bath oil, I think it’s my favourite beauty treat.